Beyond Redemption is the feature film directorial debut from longtime stuntman, Bruce Fontaine, which makes sense considering the only time the film is slightly bearable is during the sequences of action. The rest of the filmmaking is wholly incompetent, from the derivative undercover cop narrative to the poor production values. This could have been a moderately amusing low budget action film, but instead resigns to being a humorless melodrama with a few fights scenes sprinkled throughout. 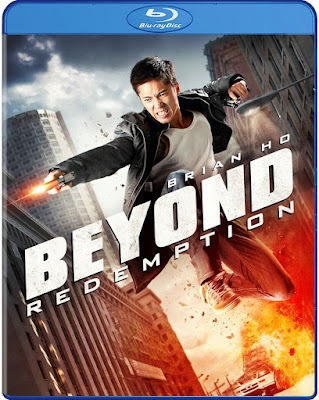 The story for Beyond Redemption is so unoriginal that I nearly feel like a plagiarist just recounting a plot description. Undercover copy Billy Tong (Brian Ho) infiltrates a gang in the violent underworld of Vancouver, all in an effort to get close to the Triad. While trying to keep his cover with the leader of his gang, Yuan (Don Lew), Billy becomes involved in a plot to kidnap the daughter of a Triad boss. Melinda (Josette Jorge) is unaware that her father is a major gang leader, making her an innocent pawn in the kidnapping scheme. Billy recognizes that she doesn’t belong in harm’s way and endangers his own undercover operation in order to keep her safe. This storyline is dragged out through many senseless scenes of bad acting and overly serious dialogue, complicating a simple story with too many characters and unnecessary scenes. The only time any of it is even moderately bearable is during the carefully choreographed scenes of martial arts action. Despite plenty of guns in the narrative, most of the action is carried out with martial arts. This shows the true reason for much of the casting, which is a relief considering how ineffective the acting is. Carefully constructed fight scenes are the smallest sliver of hope in this production, surrounded by countless examples of filmmaking incompetence. Occasionally the fighting switches to gunplay, which is plagued by poor CGI muzzle flashes and bullet wounds. I would not recommend this film to even the greatest of action fans. Even viewers who have watched all of the straight-to-video action films starring Steven Seagal would be better off skipping this one. The Blu-ray only enhances the filmmaking flaws, and a handful of special features do nothing to improve appreciation of this minor entry into the undercover cop narrative.